Hey there! Today I get to share with you one of the new collections by Pebbles! WOO HOO! Front Porch is a fantastic line for everyone. There is a multi-functionality that is fabulous. So let me show you. 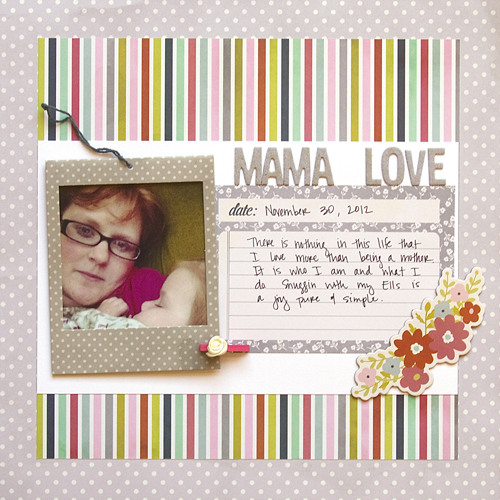 -I can use this line for both cards and scrapbook layouts. Super easy for both. - Love the florals in this. Some patterns are bold, others very subtle. A great blend of both. -I love how easy it is to make a project. The pad of phrase cards, the bag of chips, everything is so easy! -Honestly, nothing. No complaints at all! Available Online: Not available online just yet. Bottom Line: I love this collection. It just makes me happy. I can whip out multiple cards in no time at all and I can add super sweet touches to a layout with the great embellishments. What do you think? Is this a collection you would like to have? Not your cup 'o tea? Let us know! Leave a comment by midnight EST on Wednesday to be entered to win a Front Porch prize pack from Pebbles! WOO HOO! U.S. residents only and please leave a way to be contacted if you win! Labels: Ashley Harris, Pebbles Inc.
That is a great collection! I'm heading over to the site to see all the pictures. Love your layout, superbly cute!! I feel very inspired. It is a great collection. I love the chalkboard pocket, the flowers, everything. I could certainly use these goodies. I need to make a couple of mini albums for summer--trips! I love the cards you created! The colors are wonderful and the designs are so much fun! I would love to play with this collection! Thanks so much for the chance to win! I was pretty much "eh" on the collection, but I like how you used the chipboard. And you wrote "phrase cards," so I had to do a search for those. So the conclusion is, great embellishments, but don't really need the paper. Great projects! Love the colors. I will have to check out the entire collection. This collection is one of my must haves from CHA! Such pretty colors! Could certainly put this to good use! i would be so excited to win this collection -- it is darling and you've done a great job with it! 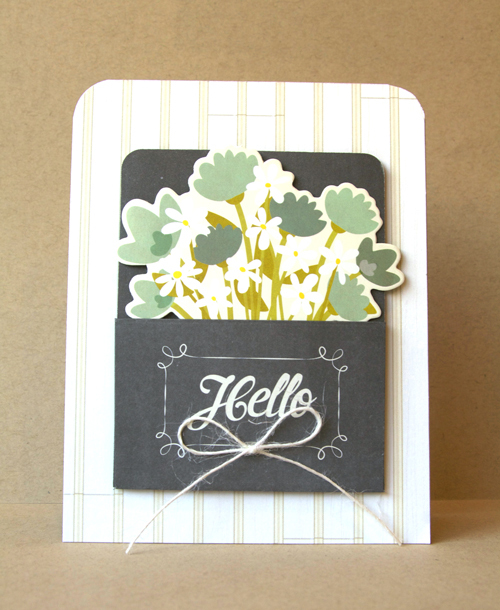 Cute, cute cards and a lovely layout. I am loving the subtle colors in this collection. The colors are so fresh in this collection. I could make tons of projects with it. Great looking collection! I really like your projects but your "thanks" card is my fav. This is a beautiful collection!! Love the colors and prints! Love this collection! Thanks for sharing your projects. It looks like this collection includes a very pretty gray to complement the rest of the palette. Since I am on quite the gray kick recently, it really appeals to me!! Yes, I think it's a wonderful collection! Love the little die cut flowers shapes and the jar! Thanks for the chance to win and your cards are beautiful! Lovely collection, sweet and simple. You used it perfectly, very nice! Looks like a really fun line, I like your cards! The striped paper, the pocket, the flowers, they are all really nice. I have a feeling that I would like these as all around useful, cute papers. I think it looks super fun! LOVE the colors of the florals, and the pops of black in there as well!!! Looks like a versatile collection! I really like Pebbles collections! This one is adorable! Great colors! Love what you created! I love Pebbles products and this collection is super cute! I love these, projects that are easy but look this good are the best! Saw your project at nifty thrifty things & clicked over - I also wanted to tell you I love your blog header design, completely adorable.